Carpentry and joinery hand planes made out of mainly wood. 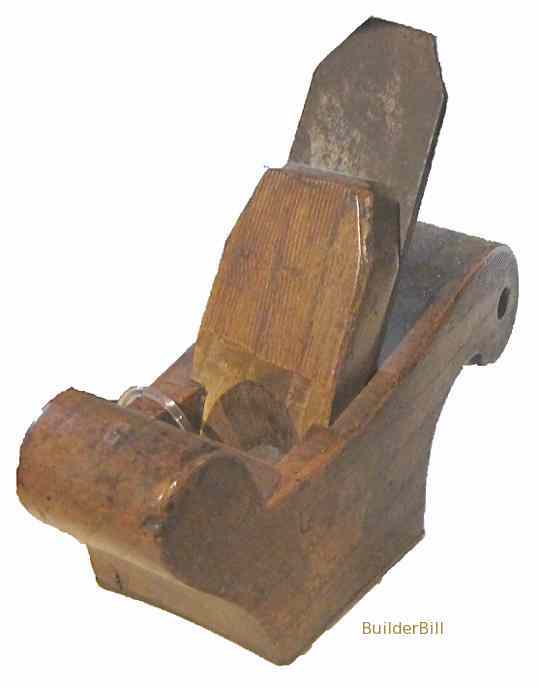 The oldest form of hand plane. The longest of the hand planes used for straightening timber. 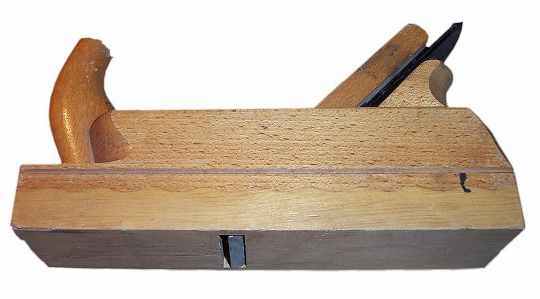 The all purpose Carpentry and Joinery plane. Between the try plane and the smoothing plane in size. A wooden plane with a handle at the front. A hybrid metal and wood plane. An early 19th. century purpose built try plane about 1800mm 6 Ft. long, used with the blade up and mounted on one end of a bench and the other on a trestle. Used for truing up barrel staves. The plane was fixed and the work moved. In effect this was used like a modern jointer machine. The longer the bed the easier and quicker to straighten the timber. Above is a photo that I took at the historic Royal Dockyard at Chatham in the UK. The planes were inside a glass case so apologies for the annoying reflections (including some old guy's striped shirt). NOTE! The names and respective lengths of any old wooden planes are a bit of a movable feast. 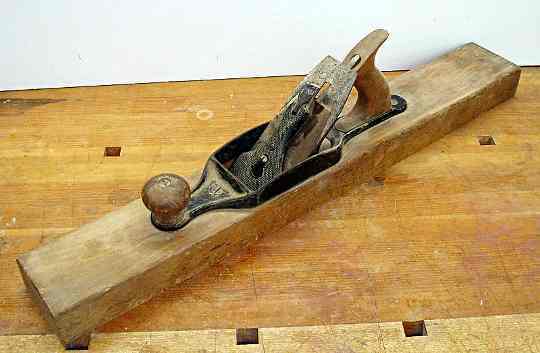 One man's smoother can easily be another's jack plane. One of the main facts with wooden planes is that they were often made by the person who used them and so they were built to the owner's specific needs. At the top is a Try Plane or Jointer. They are usually the longest of planes and used for truing up and jointing boards. The normal size goes fro 450mm (18") up to about 600mm, (24"). I have seen a try plane in a shop in Belgium that was about 1500mm, (5 Ft). long that had a conventional layout with a handle, but it was obviously a two man tool because it had a metal eye bolt set in the front end for a second person add a pulling force via a rope. The smaller plane is a typical traditional English Wooden Smoothing Plane. Compact and with curved sides. It is about 150mm (6") in length. The longer planes have the stronger fully enclosed handles, the jack planes have open handles and the smoother has none. All of these English pattern planes were usually made from Beech, and from time to time the soles had to be trued up, that is planed flat again after a period of wear. Sometimes when the mouth got too worn it was common to insert a small piece of something like boxwood into the front of the mouth to tidy it up again and narrow the mouth gap. All of these old planes may appear crude compared to metal planes with their various adjustments, but in skilled hands they can be tuned to produce excellent results. One reason for the ease of cutting and quality of work produced in the thickness of the cutting irons and backing irons. They are so much thicker and more solid that modern steel plane irons. This solidity gives a shudder free smooth cut in all sizes but it is particularly noticed in the smoothers. The bottom plane in the photo above is is an early example of aTransitional Plane. When metal planes started to become used in the middle of the 19th. century some manufactures started producing what is known today as transitional planes. 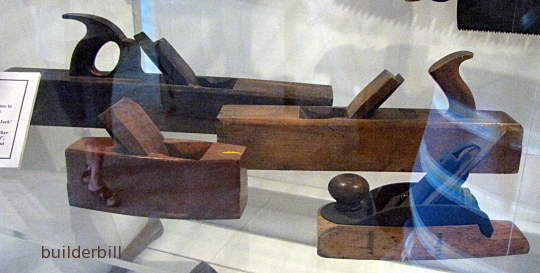 These hybrid metal and wood planes consisted of all the metal working parts needed for the ease of use of the new metal planes but at the same time each individual user could make their own bases. I guess they thought there was a market for these half and half planes. They came in all shapes and sizes but as far as I know, the mainstream of plane users split into two camps. Those that simply stuck to the all wooden planes and the ever growing number of metal plane fans. Four smoothing planes seen at the Zuider Zee Museum at Enkhuizen in Holland. Following on from the previous photo there are two more small transitional planes and a couple of small wooden smoothers. I served my time as an apprentice with a guy called Walt Sawyer. He was about 78 years old and still working when I last saw him. He only ever used wooden planes. Old Walt scorned all attempts to get him to buy a new "modern" steel plane. His old jack plane was ready for the scrap heap being worn down in depth to almost half of what it should be. One thing that always stands out in my memory is that there were indentations in the front sides of the plane at least 15 to 20mm deep caused by his fingers and thumb. That jack plane fit him like a glove and it was no wonder that he didn't want to lay it aside and start breaking in a new one. When I first came to Australia after only ever seeing Pommie tools I was amazed at seeing German jack planes and smoothers very similar to the one above. I couldn't understand why the Aussie carpenters had taken to these wooden planes when they were introduced into the country by German migrants. I found out part of the reason one day when I was complaining about the quality of some Australian hardwoods. Rough as guts timber with strange outlandish name like blackbutt, iron wood and blue gum. How the hell do you work this stuff I asked an old chippy. Well the old guy said, "You throw a bucket of water on it and then flog the crap outta it with yer German jack plane." Only my opinion of course but this pattern of plane, the German Jack Plane and the German Smoothing Plane seem to be the only survivors of the vast array of wooden planes that used to be available. There are still new ones being made by specialist makers for a small market of fans. A small wooden plane also seen at the Zuider Zee Museum at Enkhuizen in Holland. When I were a lad in the 1950's we had a huge cabinet full of dozens of moulding planes like the ones above. If a new moulding turned up presumably someone would modify a stock design to make it. I never used them, they were already obsolete. Stanley had made and sold they combination planes like the 45 and 55 for years, but even they were being made obsolete in small shops by the use of spindle moulders and electric routers.